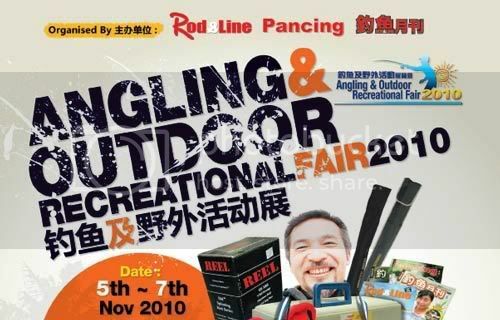 The Angling & Outdoor Recreational Fair 2010 (What a mouthful. 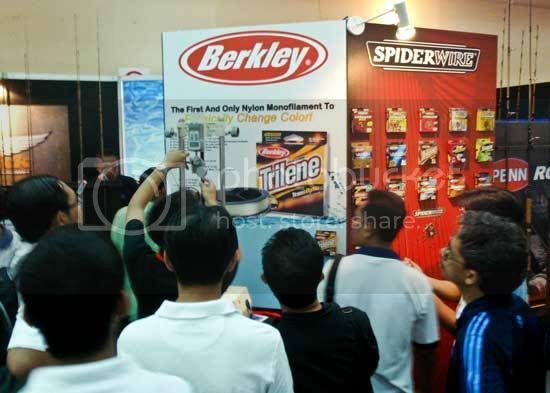 I will just call it the KL Tackle Show 2010) is a 3-day event held from Nov 5-7. Back after a 3-years lapse, the local fishing community is full of anticipation and hungry for a good show. That may be the reason visitors we talked to felt the show is lacking. The expectations were presumably high and that makes it difficult to please everyone. More on this later. We arrived early on the first day and bumped into Sea-Am Lim who was just leaving. Lim is the writer of Haruan Soup in the No Fish Talk segment of Rod & Line magazine. He was there earlier for the media/official opening ceremony. There was a large crowd and I suspect the early bird gifts had something to do with it. Can’t tell you what these gifts are though, as I do not have a clue. Overview of main hall. Click to enlarge. Garmin, the main sponsor of the event, actually took up the front area though it looks like Shimano did. 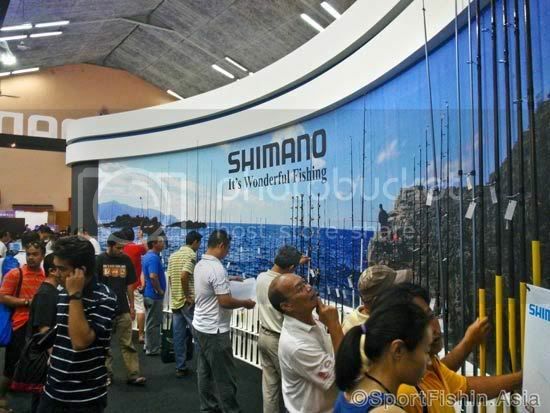 Is there something wrong with the Shimano logo? Anyway, for those who is interested to know, Garmin had some nice ladies manning their booth which showcased their GPS range. So did Pure Fishing. Good effort guys but still a far cry compared to the TFTMA Bangkok Tackle Show girls *hint hint*. Back to fishing, err… Garmin, who are also having promotional offers for their products. Garmin launched their latest Nuvi 3790 in conjunction with the show. 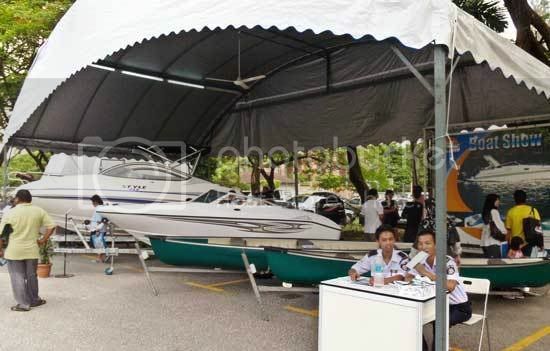 The external booth of Marine Explorer. I’d preferred if they brought along some real sportfishers like a walkabout for example. 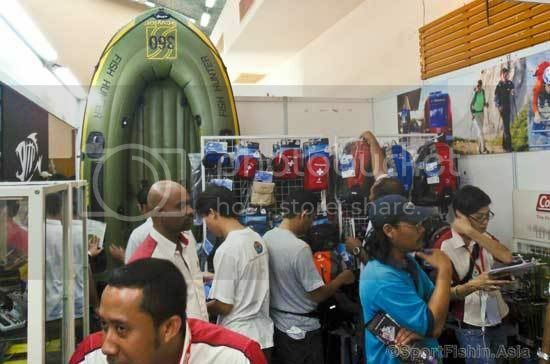 The company has another booth inside the hall showcasing some smaller watercrafts suited for freshwater fishing plus some kayaks and accessories. Pure Fishing occupied a decent area showcasing some of their latest and upcoming products. Mr Quek was busy attending to visitors so decided not to hassle him. 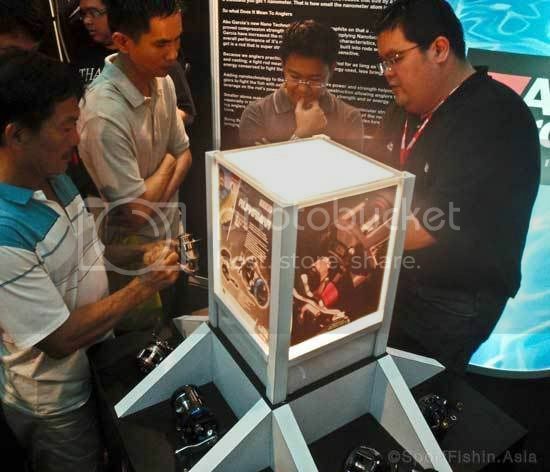 The ever hospitable Philemon Foo, Marketing and Product Manager of Pure Fishing Malaysia is also manning their booth. Abu Garcia has a reasonably huge following in the local market so understandably the booth was crowded and not helped by the somewhat cramped layout. Some of the new Abu Garcia reels look really good. Familiar looking boat! The UFL booth was pretty small and not very exciting. Quirky tagline as usual from the Japanese manufacturer. The other side displays the Shimano reels which sadly were placed locked and see-but-no-touch in glass display units. Strange also that if we wanted their product catalog we’d need to pay RM15 which they will then entitle you to a really plain (read boring) cap. Daiwa/TCE Tackle probably took up the largest space in the hall. This is where I had my first opportunity to feel the new Saltiga LD20 reel. Nice reel eh? The counter personnel stumbled over the price list when I asked how much it is. They finally said RM2,800. Odd, I found it retailing for just over $USD400 over the net and that should make it around RM1500 (excluding shipping). Huge difference. 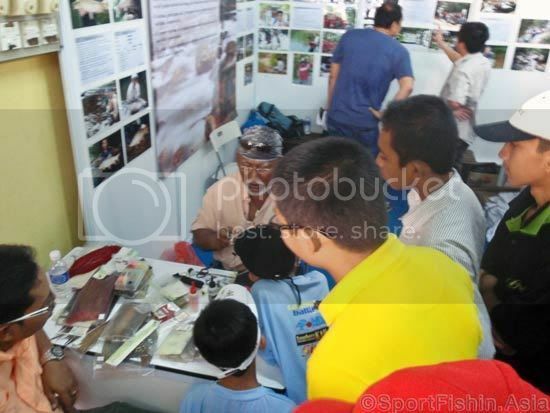 Sea Tackle and the good people of PEMM (Malaysian Angling Association) put together a fish scooping game at one corner. This is a popular game in Japan called Kingyo Sukui where one have to quickly scoop up a small fish with a small net made of fast-desolving paper. The KAGUM booth is strategically located just at the entrance to the main hall. 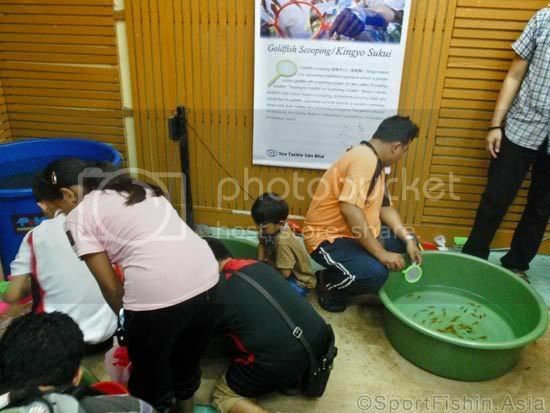 The KAGUM guys including Aznir Malek, Mingmon and others was there explaining the voluntary effort of this NGO, whose main goal is the conservation of the king of Malaysian river fish, the mighty Malaysian Mahseer or more popularly known as the Kelah. KAGUM also actively organizes river clean-up campaigns. Hats off to these guys! Pak Amin has the crowd mesmerized with his fly-tying skills at the KAGUM booth. 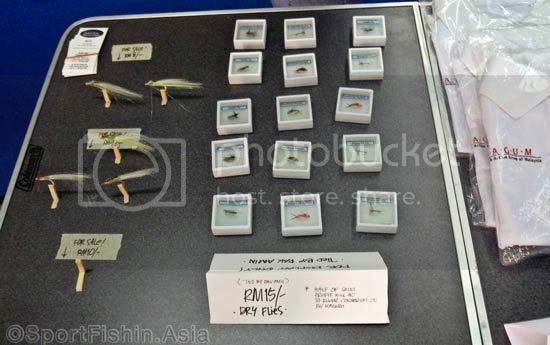 Some of the flies for sale with proceeds going toward KAGUM. Being a sucker for conservation of our sport and its environment, I must have one of this nice t-shirt. Go get one, only RM35 and its for a great cause. Overall, a decent effort put together by the organisers but much can be done to spice things up. There are fishing tackles to be seen but incomplete in some ways. What’s the difference between going to this show than visiting the tackle shops? Some who went with the intention to shop were obviously not impressed. There wasn’t that retail environment for sure. 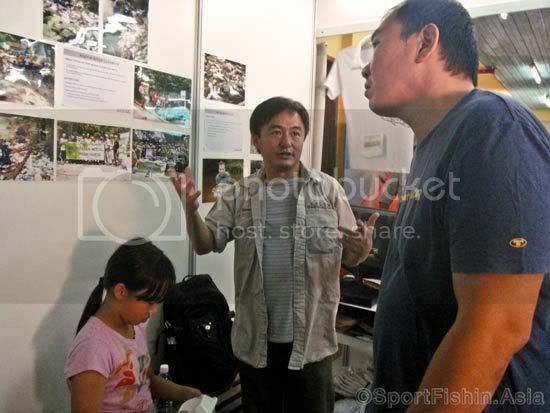 If the objective of the event is to exhibit stuffs, then perhaps it’s met its objective. But more needs to be done. On the other hand, if the purpose is to sell stuffs then it’s a flop. The ideal situation would be to have the best of both worlds. Showcasing of lots of products. Lots of things on sale plus many things to do and learn. In addition, those that were attracted or informed of the event through the advertising must have gotten the message that this fair will have its fair share of bargain what with the dude lugging an armful of fishing tackle (first image of this post). Imagine the disappointment of those that took the trouble to polish their credit cards or went to the ATM to load-up before going to the event only to feel they have been disillusioned. Maybe the terminology used needs to be re-examined. Is it a fair? Or should it be called a Show? Perhaps it felt more like an Expo? The notable brands that were missing are Rapala, Storm, Okuma, Sufix… etc. which reduced the overall flavor of the event. There were also a lack of things to do. Not enough interactions. If there are programs (I think there is) the information, or programme sheet or posters and such, is sorely missed. The MC or announcer was also divorced from the main exhibition hall and most visitors are probably unaware of what was being announced. I’ve witnessed my fair share of events and even had my hands in some, the organisers for next year’s show has some challenges to meet for sure, hopefully there’ll be one next year. And the following year. It’s easy for us to stand on the sidelines and make comments. Lets hope these comments will be taken as constructive criticism. Or maybe I’m just being an a** and expecting too much? Those who visited the show, please share your thoughts and experience. Are you a happy camper or do you want more? Your comments will be much valued! Hi Chin, you are most welcome to use the picture. In fact, it looks great in your post. I like your comments, especially the part about the lack of retail environment. I couldn’t find anything to buy myself. All the best and keep your lines tight. Totally agree with you. A total disappointment.Carried a lot of cash hoping to purchase items “Less 50 -70% ” etc.. or something to remember or talk about “2010 Angling Fair” but NOTHING only backdated Fishing magazine /CD/DVD AND SHIMANO RM15 catalog with a black cap (very hot on the head)Catalog downloadable on internet too. 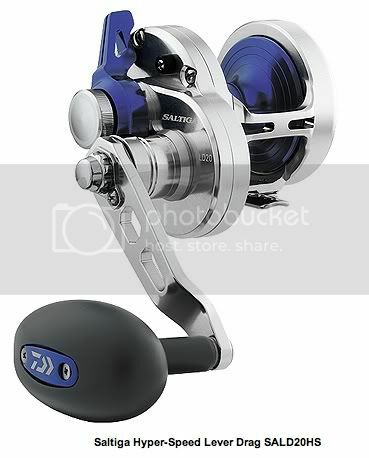 Looking for obsolete or custom made fishing rods,telescopic, rod rest/holder spare parts, etc..only to find a SG.Company selling “ABU” spinning reel with that kind of pricing and a KL Company selling solid fishing rod..pricing same as they sell in their shop. Great feedbacks. We appreciated the efforts that Rod & Line / Life Publisher gave to put the fair together. Let’s hope they will encouraged and challenge themselves to put up an even better event next year by absorbing some of the feedbacks received. We also hope all parties in the fishing and outdoor industry will play a bigger role. It will be a win-win situation in the end. In the consumers’ point of view, an exhibition type of show is always kinda boring but a “fair” type has more attraction. If they can marry both of these into one, awesome. 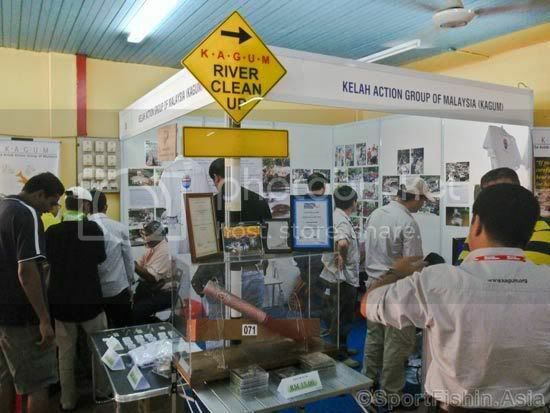 any body how nows , when KL tackle show 2011 is go ? Hi jhon, thanks for leaving your comment. If you mean if there will be a KL Tackle Show 2011, we have not receive any news yet if there will be one held this year. When is the next tackle show? No tackle show have been scheduled as yet. Sadly. We will keep our readers updated as soon as we hear something.